1. 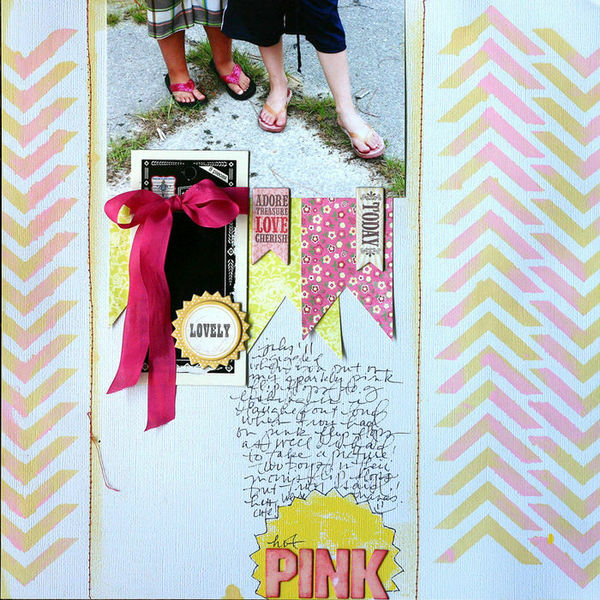 Use embellishments to emphasize what’s important on a scrapbook page. The eye looks for things that stand out, in other words, for things that contrast. The item on your page that first catches a viewer’s eye is the page’s focal point. Having a focal point is a good thing. When a viewer can identify a starting point and then understand where to look next and then next, they are taking in your story as you want it to be understood. You can use large-scale elements to draw attention and create visual impact. Remember, though, that it’s not the large size that draws the eye, but, rather, the contrast. An item proportionately smaller than everything else is just as eye-catching as one proportionately larger. Some other ways to create contrast are with differences in color, positioning, texture, shape, and orientation. Dina Wakley frequently clusters her title with her focal-point photo. On “The Falls,” she’s used a cluster of bright leaves to point the eye to her title and photo. 2. 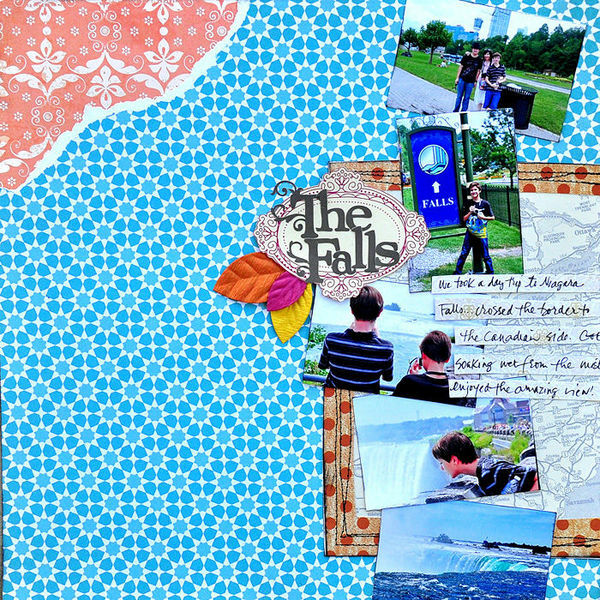 Use embellishments to create flow on a scrapbook page. When you have spots on your page that stand out, you draw the viewer’s eye. Multiple spots that stand out will guide the eye through the page. While there’s lots of red in the text print paper canvas on “Amblerville,” three spots of red embellishments stand out and create a visual triangle that frames the photo. These spots are: the two flowers above the photo, the single flower below the photo, and the cluster of 3 ornaments on the journaling card. 3. Use embellishments to ground other elements to the page and to each other. Overlap elements to ground them to each other and to the page itself. Without “grounding” elements can feel like they’re “floating.” The connection to other elements is important. Embellishments at the top left and bottom right on the photo on “H” serve to ground it to the layers beneath. 4. Add repetitions with variety to your pages with embellishments. Repeating elements on a page adds unity. Elements you can repeat include: colors, shapes, textures, motifs, and patterns. Note, though, that repetition without variety can be dull. The embellishing challenge, then, is to think about how to change something while keeping it the same. Repeat an image or shape in different sizes. Use the same color on different elements of the page (alphas, ribbon, paper). Use a variety of tones of the same color in different page elements. Scrapbook page embellishments add charm, deepen meaning and serve as useful tools for implementing visual design principles that make a well designed scrapbook page. Use them to ground, create flow, emphasize and add repetitions with variety to your layouts.